Center for American Progress: Campus Progress National Student Conference – Washington, D.C. In early 2005, the Center for American Progress launched Campus Progress to promote progressive policy by supporting student activists and journalists on college campuses around the country. 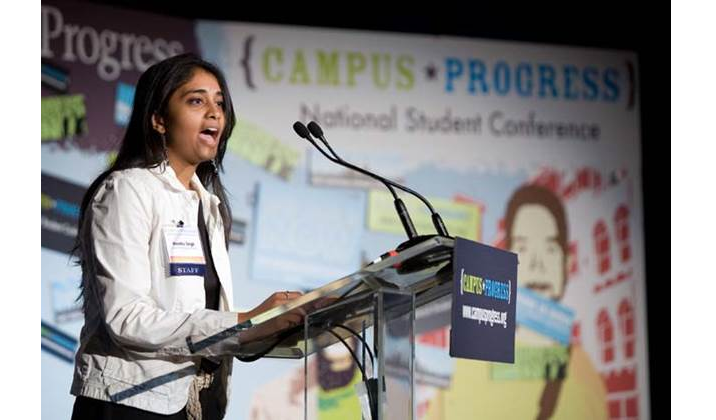 Later that year, Campus Progress produced its first Campus Progress National Conference, an event that continued annually through 2013. Rendezvous Consulting Group was there at the beginning, supporting the brand new Campus Progress team over a year-long planning process that began with early conceptual discussions about event goals and objectives and that concluded with a widely successful one day first annual event that featured President Bill Clinton as the keynote and that was attended by more than 1000 students from across the country. Our team supported Campus Progress with everything from start to finish: venue selection and negotiation, stage management and production, speaker identification, outreach and briefings, student recruitment, registration and check in, student grant packages and travel booking, backdrops, signage and other collateral materials, media logistics, budget development and management… and the list goes on. Over the years, the conference was expanded into a multi-day schedule with days dedicated to grassroots training, student lobbying and journalism workshops. Keynote speakers have included Barack Obama, Al Gore, Nancy Pelosi, and many others. The conference has been recognized over the years by event industry publications as one of Washington’s Top 100 Events. Rendezvous is proud of the role we played helping Campus Progress to lay the foundation for many years of success and for our support of the Conference through its early years.